Rounding up our list of the best 10 April Fool’s Day jokes is the good ole classic prank. Everyone enjoys a classic April Fool’s Day joke; something that is easy to perceive as untrue but in a way that makes everyone laugh. Consider HelloFresh’s Unicorn Box – it goes against everything (well, just about everything) that HelloFresh as a brand stands for. Therefore, it’s very obviously a joke. However, the bright, colorful pictures and funny packaging give you a good chuckle in the moment. This style of prank is not quite as obvious as its predecessor. Typically, this includes a product or service that fills a very specific niche. This year, it came in the form of the Roku Press Paws Remote. Want a television remote designed entirely for dogs? Well, now there is one – psyche! While it’s relatively unbelievable, it still exists in the realm of possibility (we’ve all known someone who loves their dog that much). Every April Fool’s Day, there is always one company who jokingly advertises an item you’d be willing to shell out big bucks for (you know, if it were real). This year, BMW takes the cake with their Lunar Paint. According to their blog, it’s a type of paint that charges their electric cars by moonlight. These are always fun but, we won’t lie, they do make us a little nervous because, if they were real, I think we’d all be going broke. What’s funnier than advertising a new tech gadget to a bunch of technology experts? Advertising it to people who love flowers. And if you’re thinking that sounds ridiculous – that’s the point! This year, Google introduced the Google Tulip as their April Fool’s joke; a way to let your Google Home talk to your flowers (if those flowers happen to be tulips). This style of joke is one that you’re always kind of bummed to find out isn’t true. Futurism.com decided to mess with those of us who were around for NASA’s huge announcement in 2006 with their prank that declared Pluto was being reinstated as a planet. 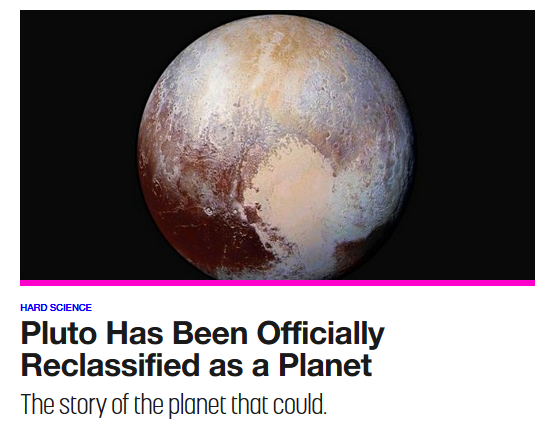 While this may not be factually true, Pluto will always be a planet to me. Everyone’s familiar with this style of prank; it’s one that, more often than not, mimics a public issue in society. This year, Logitech clearly went the funny route with their commentary on the “new” Logitech Hamsters. According to their site article, wireless computer mice should actually be called “computer hamsters” as they do not have tails. Is there such thing as a romantic April Fool’s Day joke? Petco seems to argue “yes” with their hilarious Instagram post for Furever Weddings – the official line of wedding services coming to a Petco near you! It just goes to show that not all April Fool’s pranks have to be slap-your-knee funny; some of them can make you say “aw” instead. Humans love to think with their stomachs, so a tasty prank is always a funny route to go. For example, the American Homebrewers Association revealed a brand-new category for the National Homebrew Competition: glitter beers. After all, what’s classier than a beer that shines in the light? Did we miss something great? Let us know about your favorite April Fool’s pranks this year and join in on the conversation. Interested in learning more about our process when it comes to digital media and design? Chat with us at inquiry@mediag.com or call us at (248) 687-7888.